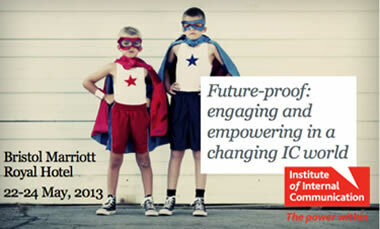 In keeping with the theme of ‘the future’, I predicted on Twitter that the IoIC annual conference was going to be our best yet (I do admit that as an organiser I did have a bit of an insight, but still! ), and I wasn’t wrong. With speakers including Brooke Kinsella MBE @brookekinsella, Euan Semple @euan, Linda Moir, Perry Timms @perrytimms, and Deborah Hulme we were feeling pretty confident. Even a 3am fire alarm on Friday morning couldn’t deter us – although a strong shot of coffee at breakfast certainly helped! We began by hearing from a panel debate that I personally found extremely valuable. It comprised representatives from HR, marketing and change management discussing how they view IC, what they feel its role is in the organisation and what they expect from it. It sparked a passionate debate over whether IC should have a place on the board. As you might have guessed, delegates thought that we couldn’t be trusted advisors without having a seat at the top table, but one panellist felt that reporting into a director with a voice in the organisation would be just as effective. However all three were positive about the impact we can have, but stressed we needed to be more strategic to be able to offer real value to a business and to be taken seriously as a function. Brooke Kinsella MBE opened the conference on Thursday morning; I think some people were confused as to why we had chosen Brooke as our keynote speaker, but she left the audience in no doubt as she described the journey she had been on since her 16-year-old brother Ben’s murder in 2008. Not only has she connected with disengaged youth, she has changed a law, secured £18 million of funding for knife crime services and been awarded an MBE. She spoke about how social media, listening and authenticity were key to her success. Authenticity emerged as another strong theme as the conference went on. We then heard two very different case studies. Emily Gibbs @EmilyJG, Corporate Communications Manager at the Financial Times (FT), spoke about taking FT employees on a digital journey. She began by plotting employees on a digital spectrum so she could understand what was required to get people on board with their profile based, self-moderating, online business collaboration tool. Organising a digital learning week and implementing a lunch and learn video has resulted in 85% of staff being registered and active. Linda Moir led the front line services team for the Olympic and Paralympic games and had the job of engaging 15,000 volunteer Gamesmakers, ensuring they knew what was expected of them and that they embodied the spirit of the Games. Next, Jonathan Phillips, @DigitalJonathan, from Coca-Cola Enterprises, David Orford from UK Trade and Investment and Mara Tolja, @Tolja, from Deutsche Bank provided master classes in SharePoint, Yammer and Jive. The 20 minute slots gave delegates a taste of the different platforms and hands shot up with questions at the end of each session. The afternoon was far more interactive and provided a much needed jolt of activity after a morning of intent listening. Deborah Hulme split the room into four groups and asked each table to discuss a different issue. My table had ‘the blurring of boundaries between internal and external comms’. Armed with post-it notes, we mingled with other delegates to find out their thoughts and reported back to the rest of the group and furiously scribbled on our paper table covers. The topic of gamification was presented by Perry Timms, @PerryTimms, a strategic HR practitioner and Tim Hall from Cognify. We played a game that involved drawing gingerbread men multiple times and strategically placing them on other tables to gain points. While chaotic (and fun), the aim was to demonstrate that gamification is the new way to drive and assess employee behaviour. Rounding up an eventful day was Priscilla Morris of Loud&Clear. Having seen Priscilla speak before I knew that it would be an eye-opening session as the voice is often our strongest communication tool, yet we give it little consideration. The theme of ethics continued into Friday morning with a presentation from Isabel Collins from Radley Yeldar and Andrew Gardner from Severn Trent Water on ‘grey areas’. Definition of a grey area: not speaking up if we noticed a restaurant had forgotten to charge us for our second round of drinks. We were then given scenarios to discuss at our tables. We then heard how Radley Yeldar helped Severn Trent Water to communicate ethics to its employees by involving real employees in their campaigns (authenticity again) and communicating key messages through managers. They did this via video, e-learning using employees’ real life scenarios, and manager toolkits. AstraZeneca shared its challenge of rolling out a training programme across its sites with a travel embargo in place. No mean feat! Heather Derrick developed a virtual training programme where managers had to take part but it was kept interactive by initiating a discussion every couple of slides. The software (Saba Centra) Heather used was also important as it allowed her to monitor whether people had dropped off so she could helpfully invite them along to the next session if they had! I loved the next session from DRP Group on augmented reality. It’s hard to describe in words as the whole point of the technology is that it’s a visual feast for the eyes but it certainly changed the way I view events. It brings the subject to life and places the presenter in virtual worlds to allow them to better demonstrate their point. And it wasn’t as expensive as you think (for big corporates that is). Dean Royles, @NHSE_Dean, Chief Executive of NHS Employers presented on what it was like to engage a disparate workforce. He talked about the challenge of getting senior managers to use social media to lead the way for employees. There are now several Twitter chats that take place between employees in their different disciplines. Closing the conference was Euan Semple, @Euan, discussing social media and how to bring it into organisations, as well as how to prepare for the arrival of “Generation Z.” He pointed out that we are often asked to justify the ROI (return on investment) of social media but he suggested we turn that around and challenge others to justify the ROI of preventing social media. He also discussed security concerns including trolls and emphasised that age is no barrier. Euan certainly positioned social media as the future and while it can be scary, you certainly don’t want to be left behind.